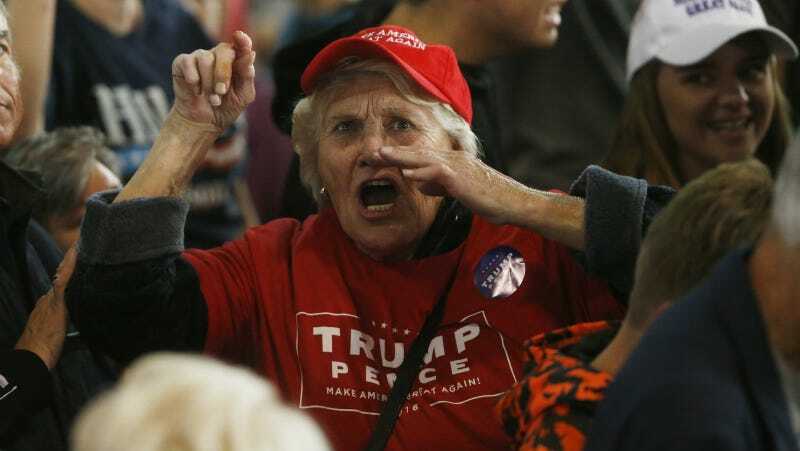 A man at a Trump rally in Minneapolis this weekend sparked outrage after a Reuters photographer spotted him wearing a shirt that read, “Rope. Tree. Journalist. Some assembly required.” The shirts have been around for years, but in a climate where Trump is singling out reporters from the crowd for verbal tirades and abuse, and where his security team is choking photographers and slamming them to the ground, they take on newly disturbing dimensions. It’s probably not necessary to point out that suggesting that reporters be hanged from trees until they’re dead is particularly ugly. We’re not all that far removed from the time in our history when black men and women were being publicly lynched for imaginary crimes, and it takes a special kind of nastiness to make that into a joke. This is already a uniquely dangerous time to be a reporter. Journalists all over the world are murdered with impunity for doing their work, with the Committee to Protect Journalists saying that Islamic extremist militant groups are responsible for many of the killings where the perpetrators go free (what the CPJ measures on their so-called “Impunity Index.”) They’re closely trailed by criminal groups in Mexico and throughout Latin America: drug cartels, as the Washington Post reported earlier this year, have learned that they can kill reporters with seemingly very little consequence. Wearing a press badge used to guarantee relative safety in a war zone: in 2014, the FBI began warning that ISIS sees media as particularly appealing targets for kidnapping. They have murdered a number of journalists in the past two years, usually by beheading. All of which is to say that it’s hard not to feel a deep concern for what will happen to reporters on the ground tomorrow covering Trump rallies across the country, particularly when, in all likelihood, he loses. Fast Company reports that the shirts have been pulled from Zazzle, one of the online stores carrying them. They’re still for sale on Teespring, though, and some nice people are very excited about ordering it.